Technology is awesome for political campaigns. Websites, Facebook, Twitter, and of course those ubiquitous email reminders that we need to give candidates money. But there’s still something to be said for good old-fashioned shoe leather hitting the pavement. The Terry McAuliffe gubernatorial campaign is touting its door-to-door efforts. 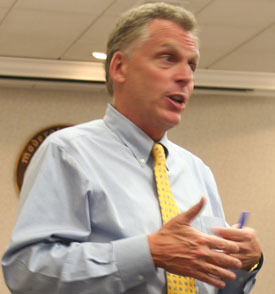 According to the campaign, McAuliffe volunteers have knocked on more than 1.5 million doors in the 2013 election cycle. The campaign has 12,000 volunteers signed up for a four-day door-knocking blitz starting Saturday and running through Election Day on Nov. 5. That, in addition to raising more than $8 million in the Oct. 1-23 reporting period. The McAuliffe campaign feels ready to push its message on the streets, on TV and radio and elsewhere.